Wallace closing in on Fleetwood Town contract? 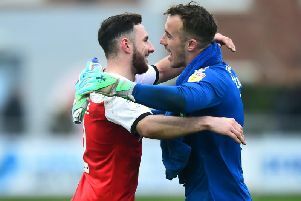 James Wallace could be in line to make his Fleetwood Town debut against old club Tranmere Rovers as he bids to earn a permanent deal. The former Sheffield United man’s contract at new League Two side Tranmere Rovers expired in the summer but he is hopeful of signing a deal with Town. The 26-year-old has been training with Joey Barton’s side since their pre-season training commenced on June 18. It is going well with Barton keen on the midfielder given he was part of the 26-man Fleetwood squad that went on the pre-season tour to Hungary. The team arrived back in the UK on Sunday with Wallace still yet to be signed up or feature in a friendly fixture for Barton’s new side. The Liverpudlian has been proving his fitness with Town wary given he is has yet to play more than 30 league games a season in his career. He has not yet been fit enough to feature in Barton’s four official pre-season games but, after continuing to build up his fitness on the club’s tour, Wallace could be an official Town player by the time Barton aims to make it five wins out of five when they head to Prenton Park on Saturday. As one midfielder nears a contract, however, the end looms for Toumani Diagouraga. Heleft Plymouth to join Town in January but failed to produce his previously impressive form at Highbury and was left out of the Hungarian tour. Instead, he featured for Town’s development squad in a 4-3 pre-season defeat at Welsh side Rhyl last week and has been told the door is open for him to leave. Barton told the Gazette: “We told Toums that he can leave the football club and that the way we want to play just does not suit him. “We’ve got a lot of good young players.